It is no secret that one of the biggest mistakes an online advertiser can make is to spend money blindly by not having the proper analytics tracking in place. However, from time to time we come across an advertiser who wishes to promote a product on third party sites like Amazon, and will send paid traffic there. In such a scenario, it is often not possible to retrieve the necessary data to make decisions on how to manage the campaign, as much of the Amazon data is privy. In a recent Adwords campaign analysis, we discovered that a client was allocating a large budget to promote a product that was less than $20. There was no internal software tracking the product sales and traffic sources, and the only data available was the number of products sold via Amazon on a weekly basis. Of course our first reaction to the campaign was – this is a ridiculous waste of money and no one should ever spend money that cannot be tracked! Our immediate instinct was to go ahead and pause this campaign. And yet, we did no such thing, and instead decided to run a correlation analysis to see if Amazon sale of the product can be attributed to the Adwords campaign. And then calculated the correlation coefficient between Adwords Clicks to the number of products sold (as reported by Amazon). In Excel or Google Spreadsheets, there is a function that calculates this automatically; input =CORREL(array1,array2). But you can also calculate it manually using this equation. 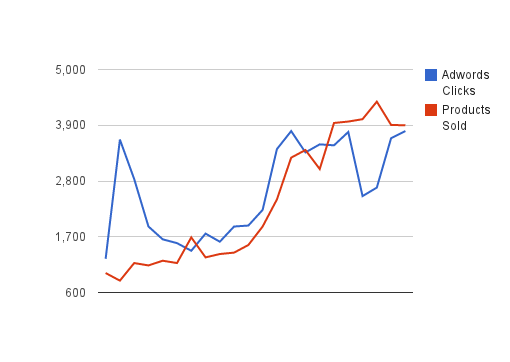 Our resulting correlation coefficient for this data set is .68, which indicates a positive relationship (0 indicates no relationship, and 1 indicates a perfect positive relationship) between Adwords spend and Amazon product sales. So you can see the trend. And the results speak for themselves. As you can see, the revenue generated and the ROI are very strong and so we will not be pausing this campaign for now. It is imperative to review whatever data is available to make an informed decision, and the method above helped us to fill in the missing pieces of the puzzle. There are certainly other ways – share your methods in the comments below!